Some jazz musicians are garrulous, bubbly; Vic Dickenson barely spoke, and when he did address a comment to someone else on the stand, it was hard even for a practiced eavesdropper to catch what he was saying. Often his words were punctuated by a laugh that would be difficult to describe. 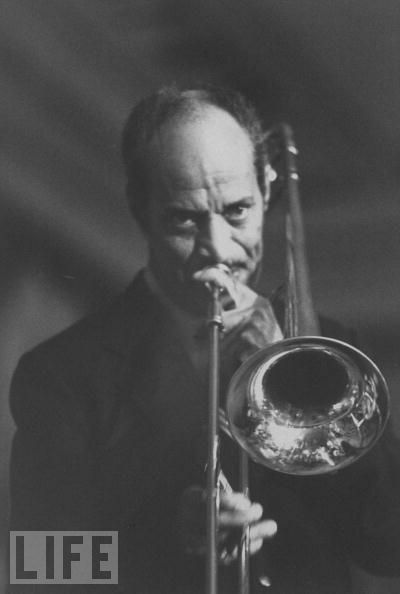 When Vic was photographed, because of the trombone’s intrusive size and shape, he often looked like a man at the mercy of his instrument, his brow furrowed. Photographs also captured him looking angry — which was misleading, for he seemed the least contentious of men. Here’s an uncredited photo study of Vic from LIFE magazine, presumably from the Fifties (I date it by his hairline). It captures his seriousness, as well as some delightful reflections in the trombone’s bell, although it can’t summon up his sense of humor, his wonderful sound and sounds. For that, thankfully, we have the recordings he made over nearly half a century. A jazz blog like this one might easily become necrological– mourning the deaths of musicians and jazz scholars or sadly celebrating players who have been dead a long time. It’s a battle to tear one’s eyes away from the rear-view mirror and focus on the present. But since I do not expect to see the celebrations for Big Sid Catlett’s two-hundredth birthday, readers will forgive me. Sidney Catlett was born on January 17, 1910 and died before I was born. I don’t believe in “the best,” but Big Sid might well be The Master — at least Max Roach thought so, as did Jo Jones. Beyond legend, there is the recorded evidence: he could play propulsively and eloquently with Benny Goodman, Louis Armstrong, Charlie Parker, Don Byas, James P. Johnson, Sidney Bechet, Mildred Bailey, Art Tatum, Oscar Pettiford, Buck Clayton, Ben Webster . . . and those are only the recorded performances I can call to mind. But being versatile, in itself, is not enough: many musicians have been versatile without being particularly distinguished. What made Sidney Catlett so special? For one thing, his instantly recognizable beat. Even simply keeping time — using one of his seemingly numberless varieties of wire-brush sweep or playing the hi-hat — his time is identifiable. Whitney Balliett, who first helped me to listen so closely to Sid, noted that Catlett played a fraction ahead of the beat — many drummers find the best and sit right down on it — but Sid’s time seemed to urge the band forward in the most jubilant way, although he didn’t ever rush. Along with that beat there is his gallery — or galaxy — of sounds. His drums sound alive. The snap of his closed hi-hat. The seductive come-with-me of his brushwork. The thump of his tom-toms. The masterful NOW! of a Catlett rimshot. Drummers of the Forties and beyond tried to copy him and some came close to capturing the broadest outlines of his style — J.C. Heard for one — but their sounds are somehow flatter, narrower, more monochromatic. So his sound is immediately identifiable — dance music, no matter what the context. As with all the great artists, much of Sidney’s mastery is not just in what he did — but what he wisely chose not to do. Many drummers, then and now, play at the same volume as the horns. Sidney knew how to play very softly — which made his thundering climaxes so impressive. Some drummers insist on filling up all the spaces. Or they accent every note, enthusiastically but unthinkingly. The result gets tiresome before a chorus is over, rather like a forest of exclamation marks or someone with a point to make who emphasizes every word. Sidney knew when not to play, when not to dramatize, when not to continue the pattern. There were exceptions: I think of Lou McGarity’s bridges on Benny Goodman records, where Sidney, either enjoying McGarity’s exuberance or wanting to push him along, drives the rhythm section along with relentless accents that could fell a sequoia. But Catlett understood space and variety, and surprise. He was a great dramatist behind his drums. So his percussive world sounds undated — springy, elegant, and funky. The listener says, “That’s Big Sid!” but that awareness isn’t because Catlett thrusts himself to the forefront; rather, it was because he makes his fellow musicians sound better than they themselves thought possible. I’ve been admiring his playing for as long as I can remember — one of my earliest musical experiences was hearing Louis’s RCA Victor TOWN HALL CONCERT PLUS, and delighting in the way Sid pushed everyone along on AIN’T MISBEHAVIN’. Later, I heard him with the Blue Note Jazzmen and every jazz group I could find. But he continues to amaze. As an experiment, take any record on which Sid plays a particularly engaging, swinging part (that would be ALL of them) and listen to it once. Admire the sounds he makes, the comments he provides, the support he gives to the band. Then, play it again, and try to anticipate his shifts, his accents. Experienced listeners will be able to divine some of the general motions — here, Sid will shift to the hi-hat; here’s a break coming up. But if you try to play his accents along with him, it’s nearly impossible. Sid’s pulsing work, his amazing accompaniment, is never rote. I would suggest ROYAL GARDEN BLUES by Edmond Hall and the Blue Note Jazzmen — his playing is stirring, as is his work on the recently discovered 1945 Town Hall concert with Bird and Diz. His music is amazingly generous. He lived a very short life and his recorded career is only slightly over two decades. But he gave so much to his fellow musicians and to us that it seems as if he played more — and at a higher level — than the musicians who lived longer. And he mastered the problem of being a forceful individualist while serving the community with every breath. A question of Ego, if you will. Catlett shouts for joy, but he does it so the band is even more joyous as a result. He died backstage at a concert, his arms around Helen Humes, telling her a funny story. An admirable death, I think. A a life well-lived. Ricky Riccardi really understands the majesty of Sidney: http://dippermouth.blogspot.com/2010/01/celebrate-big-sid-catletts-centennial.html. Big Sid Catlett was arguably one of the most naturally talented percussionists in jazz history. To celebrate Catlett’s centenary in January 2010, Alyn Shipton is joined by drum expert Richard Pite to pick the highlights of a recorded catalogue that includes work with the swing orchestras of Fletcher Henderson and Benny Goodman, the modern jazz of Charlie Parker and Dizzy Gillespie, and the original Louis Armstrong All Stars. Big Sid Catlett – born 17 January 1910, Evansville, Indiana, USA, died 25 March 1951. Coda: A word or two about the audio-visual aids. The Drumerworld video (posted on YouTube, of course) brings together Sidney’s three main filmed appearances (leaving aside JAMMIN’ THE BLUES) — two quickly-made films from 1946-7, SEPIA CINDERELLA and BOY! WHAT A GIRL, with a guest shot by one Gene Krupa, as well as a Soundie of YOU RASCAL YOU by Louis. I treasure these film clips but find that they need to be absorbed on two levels. Since musicians were required to pre-record their music and then mimic playing it for the camera, what one hears and what one sees are always slightly out of step . . . so one must be able to adapt to this. But the games Sidney and Charlie Shavers play . . . ! I have also liberally seasoned this blogpost with what might seem an odd phenomenon: YouTube videos of famous jazz records a-spinning. For those who did not grow up with vinyl or shellac records, what could be more dull? But I find it nostalgic in the best way — because I spent so many hours of my childhood and youth staring at the spinning label in a kind of happy trance while the music poured out of the speakers . . . very life-enhancing, and a way of getting Sidney’s sound into this post.